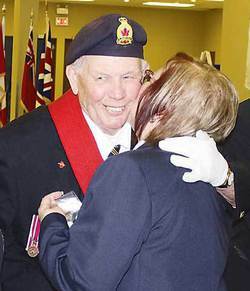 Bud Moan receives a kiss from Wetaskiwin Legion Branch 86 president Gloria Rodgers before receiving his medal for his long-term participation with the legion's colour party. As we celebrate National Volunteer Week, those who volunteered to make the ultimate sacrifice to protect our country, were honoured for their continued service to their community. The Wetaskiwin Royal Canadian Legion Branch 86 held their annual awards night and banquet last Saturday night at the Memorial Arts Centre in Wetaskiwin. “National Volunteer Week (recognizes individuals) who give free of their time to make better the lives of others,” said Mayor Bill Elliot, who brought greetings on behalf of the Wetaskiwin City Council. “Our veterans are the ultimate volunteers, whose commitment and sacrifice will never be forgotten,” Elliot added. 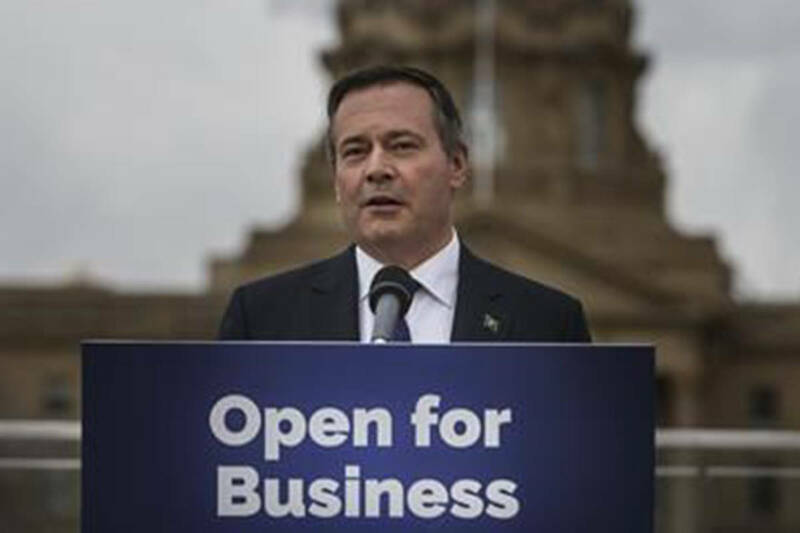 In his speech, Elliot highlighted some of the important work the legion members do in the community, including the annual Remembrance Day ceremony and poppy campaign.“[These events] speak volumes on how important the legion is to the community,” he said. Brenda Shantz, Wetaskiwin county councillor, said that because of the dedication and service to their country by all the brave men and women who have served with the Canadian Military Service, all Canadians can be proud of the country they call home.“The work you do makes our communities a better place to live,” she said. Also honoured that evening, were the members of the Wetaskiwin Ladies Auxiliary. “Without the work you do, we wouldn’t be able to meet all of our goals and objectives,” said Wetaskiwin Legion branch president, Gloria Rodgers. In her remarks to the audience, Rodgers said that the legion members are like a family. “We have our good days, sad days, and bad days but we bury the hatchet and move on, because that’s what families do,” she said. Rodgers and Legion District Commander, Hugh Greene, presented a special Aboriginal medal to three women from Hobbema whose husbands had served their country in World War II. Ester Potts, Dorothy Potts and Betty Potts received a standing ovation from the crowd as they were escorted to receive their medals. One of the most moving and heartfelt moments of the evening came with the presentation of the Lifetime Legion Member. The recipient of this presentation went to long-time Wetaskiwin legion member Roy Foster. Foster currently serves as public and information officer with Branch 86. He first joined the military in 1943. He spent his career with the Canadian military training, flying and working on various types of aircraft at bases across the country. “You know what this means? You’ll never pay dues again,” joked Greene as he presented Foster with certificate and medal. Legionaire of the Year was presented to Terri Morrow.